Dr Elizabeth Pimms thoroughly enjoys digging up old skeletons. Attempting to settle into her new life as a librarian, while also missing her boyfriend, Elizabeth is distracted from her woes by a new mystery: a royal Olmec cemetery, discovered deep in the Mexican jungle, with a 3000-year-old ballplayer who just might be a woman. 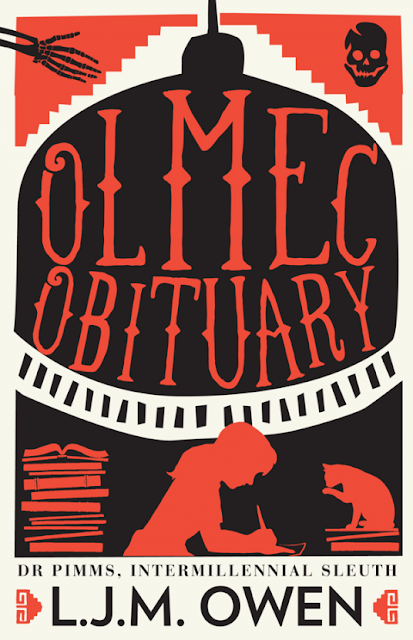 Suitable for readers young and old, Olmec Obituary is the first novel in a delightful cosy crime series: Dr Pimms, Intermillenial Sleuth. Really cold cases. 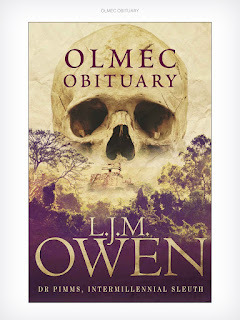 I thoroughly enjoyed Olmec Obituary, it took me back to my childhood in that it re-introduced me to my love of mystery novels - although back then I was content with Famous Five and Trixie Belden mysteries. Dr Pimms is an archaeologist, one who loves her craft, but due to a family tragedy is unable to be out on the field where she is at her finest. Instead, she has to be content with working at the library that has been central in her family's life - one shrouded in memories of her childhood, when she visited her father at his work. Contacted one day by a colleague from her University days, she is thrust into the mystery that swirls around the Olmec skeletons that she is asked to examine. Who were they? And why was she given the wrong information about them? Elizabeth is confused, and more than a little frustrated at the other archaeologists on the team who persist in producing false information. Can she find out the truth? I was a little put off by the flashbacks to the Olmec people and their culture, but was also intrigued by this back story of the people whose skeletons Elizabeth was examining - it was interesting and brought a different element to the story. This book is suitable for readers of all ages who enjoy a good mystery. I have included a photo of the cover that was on the ebook I received from Netgalley, because it is a different picture to what was on their site when I requested the book.